It was never meant to end like this. 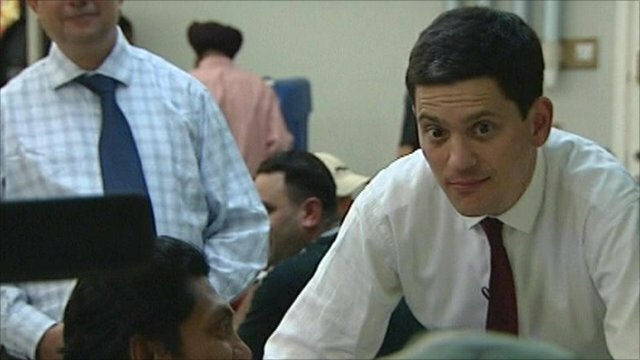 David Miliband's glittering career in frontline politics is over - for now. It is his own decision - certainly not that of Labour members, MPs or younger brother Ed, who made it clear that there was a job for him in the shadow cabinet if he wanted it. But it must hurt all the more for that. Politics has been his life since his school days, and he has been talked up as a future Labour leader, a future prime minister, for so long that a part of him must have begun to think it was inevitable. But his younger brother snatched the prize from him in the most dramatic fashion imaginable, and he has opted not to continue his career in his shadow. His return to the backbenches ends an almost textbook political career, which has seen him moving smoothly from a backroom policy supremo in Tony Blair's Downing Street to a safe seat in Labour's North-East of England heartland to a seat in the cabinet, becoming Britain's youngest foreign secretary in 30 years in 2007. But the next step to power was thwarted by Ed, who astonished observers in May by launching his own leadership bid when Gordon Brown stood down as prime minister. David's defeat on Saturday, by the slimmest of margins in that contest, brought disappointment to the New Labour old guard - Peter Mandelson and Alastair Campbell were among those who backed his campaign. Mandelson, who had booked to appear at a string of fringe meetings at the party's conference in Manchester, has been nowhere to be seen. Other Miliband supporters have found it hard to disguise their disappointment. Ed has heaped praise on David for his graciousness and generosity in defeat but there was, perhaps, a flash of David's true feelings as he sat and watched his brother's first big speech to conference as leader - the speech that up until a few days ago he had been expecting to make. As Ed told delegates it was "wrong to take Britain into war" in Iraq, a stony-faced David turned to former cabinet colleague Harriet Harman as she applauded, and asked her: "You voted for it, why are you clapping?" That brief exchange was seen as evidence that David, who kept quiet for four days about his future after he lost, would leave frontline politics. He, and many others, appear to resent the way in which Ed, who entered Parliament in 2005, two years after MPs voted on Iraq, had used his less than public opposition to the war to win the party leadership. Ed's supporters would point out that David had his chance to bid for the party leadership - and possibly save Labour from defeat - in 2007. He had rejected calls to stand against Gordon Brown when Tony Blair quit, telling the BBC he was "not ready" to be prime minister, but denied this meant he lacked the killer instinct to be an effective leader. "'I think it's about good judgement and I think I did the right thing for the country, because it was important in the middle of an economic crisis to have a strong government, but I also think I did the right thing for the party because I wasn't willing to make a bad situation worse." He also decided against challenging Mr Brown on subsequent occasions, most notably when Blairite James Purnell resigned. 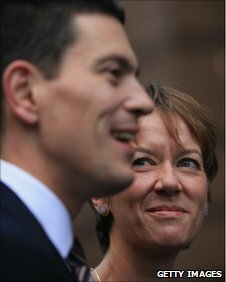 By the time Mr Brown resigned David Miliband was seen as the overwhelming choice as his successor. Indeed, as the leadership contest got underway in June, he felt confident enough to help a rival candidate, Diane Abbott, on to the ballot paper in an effort to ensure the field was not confined to white, male, Oxbridge-educated former New Labour ministers. He told the BBC he was not annoyed by Ed's decision to challenge him for the leadership, saying it was better to have his ambitions out in the open to avoid "seething resentments". David attempted to ensure the contest was not marred by back-biting between the two rival camps by banning off-the-record briefings. But as the contest reached its climax - and it became clear that Ed was his chief rival for the job - tensions began to surface, as they traded coded barbs over the future direction of the party. Former Labour leader Lord Kinnock, an Ed supporter who knows both brothers well, told a Channel 4 documentary: "David's response to Ed running has been deeply resentful." Oona King, who was at school with the Miliband brothers and remains a friend, argues that politics can tear families apart. "They can not be the same after this. I have seen it happen and I can see it happening between them." Politics is in the Miliband brothers' blood. Their father, Ralph, a Polish Jew who fled the Nazi invasion of Belgium in 1940, was one of the leading Marxist theorists of his generation - and a fierce critic of the Labour Party. Their mother, Marion Kozak, is also a well-known figure on the British left. Although they went to an ordinary North London comprehensive school, they grew up in a rarefied atmosphere of intellectual debate. Leading lights in the left wing intelligentsia made a pilgrimage to their basement dining room at their Primrose Hill home, to break bread with Ralph and Marion and argue long into the night about the future of socialism. The boys were always encouraged to chip in with their own opinions, and both joined the Labour Party an early age, to the consternation of their father, who had long since turned his back on it. Ralph did not live to see his son enter Parliament and viewed his involvement in what would become New Labour with unease. "I remember one occasion when Ralph rang me up and said, 'By the way, did you listen to that speech Neil Kinnock made yesterday?' And I said I did," says family friend Tariq Ali. "He said, 'What did you think of it?' I said 'Just empty waffle - real nonsense, Ralph.' And he burst out laughing. He said, 'I think young David wrote that speech!'" David now lives in the house in which he grew up, in Primrose Hill, with his American wife, Louise Shackleton, a concert violinist with the London Symphony Orchestra, who he married in 1998. David succeeded in gaining a place at Corpus Christi College, Oxford, where he gained a first in Politics, Philosophy and Economics and threw himself into student politics. He was seen as intellectually confident and sure of his own opinions. University contemporaries recall him working on essays in the college bar, with a pint of orange juice and a Mars bar. After working at a centre left think tank, he worked his way up to be Tony Blair's head of policy at No 10. Nicknamed "Brains", after the Thunderbirds puppet, by Alastair Campbell, the unworldly "geek" tag has been hard to shift. He became an MP in 2001 in the ultra-safe seat of South Shields. The experience of dealing with his constituents in this working-class community helped put him in touch with the concerns of ordinary Labour voters and shift some of his bookish demeanour. He has said it "opened my eyes, changed the way I think". He married Louise, choosing to adopt two children, Isaac and Jacob, from the United States, after failed IVF treatment. They chose to go the US because the adoption process can be more straightforward for older parents and both were present at the birth of the children. Opening up about his family for the first time, he recently told the Daily Mail the adoption process had made their marriage stronger: "It cemented the love and respect that we felt for each other at the end of it. My admiration for Louise was immense." He said the couple write to the boys' birth parents every six months to tell them about their progress. "Their birth parents loved them so much they said, 'You're not going to get the lives you deserve with us'," he added. By now David Miliband was becoming a familiar face to the British public, and had a growing reputation on the international stage too. He came to be seen by Tony Blair and those around him as destined for the very top - a plausible alternative leader to Gordon Brown. Mr Blair called him the "Wayne Rooney of the cabinet" (probably not the compliment it once was). It was at this time that speculation began to swirl about a possible challenge to Mr Brown, which Blairites did little to discourage. The geek tag remained. 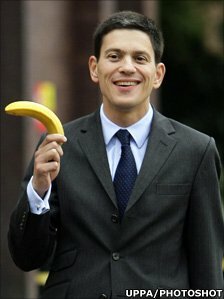 A picture of him grinning awkwardly, banana in hand, at the 2008 Labour conference would come back to haunt him. But it was accompanied by a growing sense of gravitas. After serving as an environment secretary in Mr Blair's cabinet, his ascent continued when Mr Brown took over and he became foreign secretary, at the relatively tender age of 43. When Labour lost the May 2010 election, the years of speculation and positioning finally came to fruition, as he became the first Labour MP to throw his hat into the leadership ring. He was immediately installed as favourite - the man seen by many pundits as the most credible prime-minister-in-waiting of the likely candidates. As nominations closed, he had the most backing of the five contenders from Labour MPs. He had the best funded campaign too, with financial backing from, among others, Lord Sainsbury, who pumped millions into the Labour coffers during Tony Blair's heyday, and Dave Rowntree, sometime Labour election candidate and the drummer in rock band Blur. But the first sign that the biggest threat to him fulfilling what he must have believed was his destiny would come from his own brother, when Ed grabbed the support of three of the big four trade unions. His mentor, Tony Blair, had won the leadership without significant trade union backing, but Ed was also beginning to make an impression with MPs and ordinary party members with his clear appeal to traditional left-wing values and call for a break with New Labour. He steadfastly refused to criticise Labour's 2010 general election manifesto, in stark contrast to Ed, who wrote it. The two frequently clashed at leadership hustings over Iraq too, with David continuing to stand by the decision to join the US-led invasion. They faced endless questions about how the contest would affect their relationship, with both expressing their "love" for each other on live television time and again. Their mother, Marion, was said to have found the whole process stressful and wished they had gone into academia rather than politics. In the end, the result came down to the narrowest of margins, with the votes of trade unionists swinging it for Ed after second, third and fourth preferences came into play. As Ed soaked up the accolades and toured the conference fringe in triumph, David said he wanted to take a few days to decide what he wanted to do. His decision to quit the front line - after days of feverish speculation in the hothouse atmosphere of Labour's annual conference - did not, in the end, come as a surprise. Ed was quick to praise his brother for the gracious way in which he had accepted defeat, but it became obvious that to have David, for so long the senior of the two in political stature as well as age, sharing the spotlight was just not going to work. Not least because the two are so far apart on the issue of Iraq, which would have made it difficult for David to serve as Ed's shadow foreign secretary. In traditional fashion, David has said he now wants to spend more time with his family and "recharge his batteries". He has said he wants to continue serving the Labour party, and did not rule out a return at some point. But after nearly taking on the role of EU foreign minister last year, he may be tempted to take a job on the international stage, if a suitably big one came along. Whatever happens, as Ed has said, we have not seen the last of him.